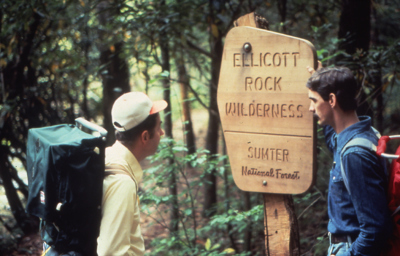 On June 19, 1984, President Ronald Reagan signed the NC Wilderness Act. But a lot of work went into the campaign to designate 68,700 acres as wilderness and 25,816 acres of wilderness study areas. Chapter activists engage in scouting and mapping on these trips in four National Forests in North Carolina. Their proposals are sent to the U.S. Forest Service. The recommendations are mostly accepted. Chapter activists on these included Rich Maggi, Ted Snyder, Dave Layland, Sam Thomas, Ray Paine, and others. A pamphlet called North Carolina Wilderness: A Reality or Just a Memory? is produced and widely distributed. The NC Sierra Club expands its state-wide grassroots campaign to build support for the NC Wilderness Act. A slideshow titled 'North Carolina Wilderness' is developed and shown at meetings and events all across the state. And thanks to Ann Taylor, the members and staff of the General Assembly also attended a showing of the slideshow. Rep. Jamie Clark from Asheville introduced the 'North Carolina Wilderness Act of 1983' in the U.S. House of Representatives. Leaders from the research Triangle Group of the NC Sierra Club take Joe Grimsley on a backpacking trip into Lost Cove and Harper Creek. At the time, Mr. Grimsley was the Secretary of the N.C. Department of Natural Resources and Community Development (NRCD) under Governor Jim Hunt. Dr. Robbie Cox, member of the NC Sierra Club's Executive Committee, testifies before the House Interior Subcommittee on Public Lands in support of the bill. Click here to read Dr. Robbie Cox's statement. The NC Wilderness Act passes the U.S. House, but is not taken up in the Senate until the next year. The NC Wilderness Act of 1984 is reported favorably out of the Senate Committee on Agriculture and Forestry which is chaired by Sen. Jesse Helms of North Carolina. The bill passes the U.S. Senate. The U.S. House of Representatives concurs with the Senate's bill. The NC Wilderness Act of 1984 is signed into law by President Ronald Reagan. 2,980 acres as an addition to the Joyce Kilmer-Slickrock Wilderness. 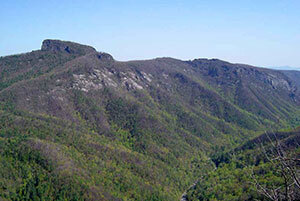 5,100 acres of additions to the Shining Rock Wilderness. 5,160 acres as the new Birkhead Mountains Wilderness. 9,297 acres as the new Sheep Ridge Wilderness. In the Pisgah National Forest: Harper Creek (7,138 acres); Lost Cove (5,708 acres); and, an extension of the Craggy Mountain wilderness study area totaling 1,280 acres. In the Nantahala National Forest: Overflow (3,200 acres); and, Snowbird (8,490 acres). In all, the North Carolina Wilderness Act of 1984 designated 68,700 acres as wilderness and established 25,816 acres of wilderness study areas.